Original Member, Illinois Commandery, Military Order of the Loyal Legion of the U.S.
William Parkinson Wright was the last Commander-in-Chief to have actually served in the War of the Rebellion, and with him, our series comes to an end. He was born March 29, 1846, in Napierville, Dupage County, Illinois. He enlisted as a private in Company I, 132nd Illinois Volunteer Infantry Regiment in May 1864 and was discharged as a Corporal in the fall of the same year by reason of expiration of term of service (100 Days). He re-enlisted as 1st Sergeant of Co. D 156th Illinois Volunteer Infantry on February 25, 1865. He was discharged by reason of promotion as 2nd Lieutenant effective June 2, 1865 and he was further commissioned a captain on July 26, 1865. During his time of service with the 132nd Illinois he was on duty at Paducah, Kentucky and Columbus, Kentucky. In the 156th he was on duty guarding the railroad between Chattanooga, Tennessee and Dalton, Georgia. On July 5, 1865 he was ordered to Memphis, Tennessee when his regiment did patrol duty until September 1865, when his unit was mustered out at Springfield, Illinois. After the war he worked in Real Estate in the Chicago area. 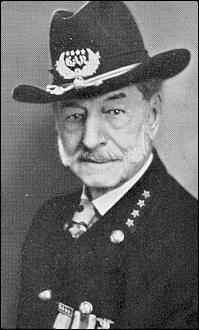 One of the early members of the Grand Army of the Republic, Captain Wright served as Commander of the Walter Blanchard Post in Napierville, Illinois and of the Abraham Lincoln Post in Chicago. He was Commander of the Department of Illinois from May 1921 to May 1922 and also served as President of the Board of Directors of the Grand Army Hall and Memorial Association of Illinois. William Parkinson Wright was elected a Companion of the First Class of MOLLUS through the Illinois Commandery on July 24, 1894. He was assigned Insignia No. 10240. He was elected Commander of the Illinois Commandery and then Treasurer-in-Chief. He was elected Commander-in-Chief of MOLLUS on October 28, 1931. At the time of his election in Philadelphia, Captain Wright addressed the Companions present as follows, "Companions, I have hardly any words to express my gratitude - perhaps it may be sympathy that I need in accepting this office. I thought when I was made treasurer of this organization that I had received all the honors that I was entitled to, and I have performed the duties that have been given me by my different Companions of the Order, in my own department, to the best of my ability. When we had in Illinois a very large Commandery, I was perfectly surprised when they elected me Commander of that organization. Twenty years from that the re-elected me again to that position so that I would be a Commander when the Commandery-in-Chief met there last year, and I had no idea of ever having any greater honor given me by this Commandery-in-Chief. I am going to do the best I can, but I am going to ask each one of you individually and personally to be a right hand to your Commander-in-Chief. Without that assistance, this office will be a failure, and we must try the best we can to be present and to promote the interests of the organization throughout the United States. Let us all together put our shoulders to the wheel and make up our minds that during this administration the Military Order of the Loyal Legion shall not diminish any. I thank you." 1) Carroon, R.G. and D.B. Shoaf. 2001. William Parkinson Wright, pp 139-141. IN Union Blue: The History of the Military Order of the Loyal Legion of the United States. White Mane Books, Shippensburg, Pennsylvania. iv + 415. Senior Vice Commander-in-Chief and Missouri Commander, Miltary Order of the Loyal Legion of the U. S.